When embarking on a yacht charter with Nanaimo Yacht Charter, you have to stop and take a moment to appreciate the variety of incredible creatures you are sharing the waters with. From the humble sea urchin, to the great Orca. The diversity of marine life in British Columbia is truly something to be awed and appreciated. In this article, we are going to walk you through some of our favourites to keep an eye out for on your yachting voyage. We look forward to hearing about all your personal experiences with some of these creatures of the sea when you visit us. Seems like a strange place to start when talking about the best sea creatures, but the modest sea urchin is actually quite the enigma. Most frequently seen when snorkelling or diving, and usually avoided due to their aggressive looking spikes, the sea urchin is actually one of the most intriguing creatures to grace the oceans of BC. They have these strange tube-like feet with which they crawl along the seabed and over seaweeds. 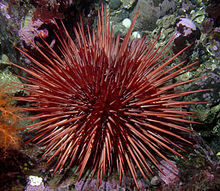 The red Urchin is the largest in BC, and there is also the smaller green species to be seen. The red has markedly the longest spines, which along with its red colour makes it look quite the menace. The green variety have shorter, thinner spines. Both are known to create barrens, which helps keep the level of seaweed at bay. But these hives of urchins attract unwanted predators such as the wool-eel who consumes them in their entirety. As well as red and green, there is the purple sea urchin which unlike the previous two survives best in crashing waves and therefore are more common by the coast as opposed to the deep dark depths. 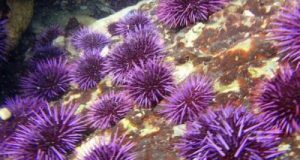 There has been increased interest in the sea urchin population recently across BC with a new pilot project to farm the little cretins. It is hoped that the spiny seafood could be the next big export of the area, and over 3,000 urchins were brought to the coasts of Nanaimo to start a three month trial. The project hopes to enable the sustainability of the delicacy and the protection of the aquaculture that surrounds them. The roe, that is the reproductive parts, are the bits eaten by humans and so the project aims to increase the mass of these parts in the urchins to provide a more valuable return per kilo per urchin. The idea came from Norway, and is exciting many sushi restaurateurs in the area of Nanaimo – and visitors alike! There has been a notable increase in demand for the delicacy, which is good as it has led to this concerted effort to sustain populations in an environmentally conscious way. It is quacking becoming known as the ‘foie gras of the sea’ with a taste that is a mixture of salty and sweet. Not that this magnificent creature needs much of an introduction, but the Orca (more commonly known as the Killer Whale) is actually a quite misunderstood creature. Now, not to shatter your dreams, but it isn’t advised to try out some Free Willy style moves with these Kings of the Sea, but you can enjoy them from the comfort and luxury of your Nanaimo yacht charter. The population of Orcas in the Northeast Pacific are currently listen as ‘threatened’ with some pods as ‘endangered’. Pods known as the Southern Population stretch from the Queen Charlotte Islands here in BC down to California. An Orca can live up to 80 years for females and up to 50 years for males. The ladies are notably smaller than males; only up to 7 meters compared to 9 meter males and lighter too at 5-7 tonnes compared to the masculine 7-10 tonnes. The dorsal fin is also a mark of gender with males reaching up to 2 meters and females rarely reaching about 1 meter. The population is erratic with fluctuations plus or minus 3 per cent. In 2008 it was found by scientists that Orca pods have such different vocal patterns, diets, and environmental needs that they could be considered a different species all together. The types are known as resident, transient, and offshore. The residents of BC are the most frequently sighted and it is impossible not to be in awe of these black and white beauties. Our residents feast mainly on the local fish populations such as salmon (their favourite) and squid, and their transient cousins tend to dine on other marine mammals. The pods are also very sweetly made up of the biological family, they stick together, which is an interesting quirk in the marine world. Pods have individualised cultures through inherited traditions and behaviours. The main threat to these beautiful creatures are toxins in the water from manmade disasters such as oil spills, which leads to toxins building up in their bodies. Also the sounds made by larger commercial boats in the ocean interrupts their communications and confuses pod members leading to accidental entrapment and disorientation. Monitoring has been underway since the 1970’s and resultantly awareness of the needs of this species is heightened and conservation efforts doubled. Yes, we are throwing you another curved ball. Just like the Sea Urchin, the jelly fish is too often feared and not often appreciated. The strange, sagging, gelatinous blobs are again most often seen when diving or snorkelling, or avoided when washed up on the shore. They look magnificent under water, and they too are an enigma – they are brainless, heartless, boneless creatures who have been around a very long time indeed (in fact it is thought they were here up to 300 million years before the dinosaurs!). Because of this, when you set your eyes upon a jellyfish, it can feel like you are looking back into a bygone era. There are over 2000 known species across the globe, and 75 of those reside in BC waters. BC’s offering includes a wide range of looks – some mushroom like, others caterpillar like, others resembling a cracked egg! All other-worldly and alien looking – they can even regenerate their own damaged tissue – or the other half of its body if it finds itself in two halves. If you are a sci-fi fan, then these ocean beasts should very much make your list of favourite sea creatures. They hunt prey such as small fish, other smaller jellyfish, and plankton through utilising their specialised stingers. These stingers have hundreds of thousands of coiled threads tipped with a barb which launches like an arrow in the prey’s direction (don’t worry about bumping into them, they are much gentler than their tropical relatives).Other jellyfish use toxins, and others use their web of flesh to entangle prey. When prey is in short supply however, they can simply survive on the amino acids present in the waters of the ocean which is one of the reasons they have been around such a long time. Around one third of BC’s jellyfish also produce bioluminescence giving them a haunting glow in the water which is magical to witness. The reason for their jiggle, and therefore their name, is that they are composed of around 96 per cent water, the rest protein and minerals. This means they spend their lives at the mercy of the currents and tides, save for a few species who latch to rocks or sea greens, and the bell-shaped ones who have the ability to propel themselves in the desired direction. The Dolphin is everyone’s favourite sea creature at some point in their life. Their playful attitude and sleek appearance is just too endearing to resist. As with most ocean animals, there is a huge variety of species out there. The most common here in BC is the Pacific White Sided Dolphin, and boy is it a beauty. This dolphin has a small and rounded ‘beak’ or ‘nose’ which contains very small and rounded teeth – making it look like the baby of the dolphin world. It acts like it too as it is full of energy and can often be spotted playfully leaping into proper belly flops and twirling in the air in somersaults. 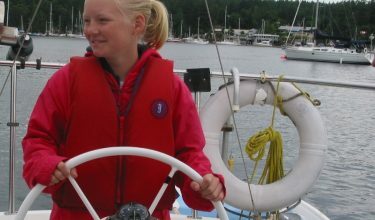 It also loves to ride the bow waves and is known to follow vessels for many miles which means you have a good chance of getting up close and personal when on board one of our yachts. Despite its quite small size is it a strong and nimble swimmer. It won’t surprise you that its name comes from its appearance. It is a gorgeous blend of black back, light grew sides, with the distinctive white strips that run from its eye to the tail. It also has a white belly, and black tipped beaks and circled eyes which give the illusion of lipstick and eyeliner – quite the beauty. The White Sided Dolphin’s dorsal fin is lengthy and has a sharp hook shape, it is light grey and black. The flippers are small too, and also rounded like the nose of the animal. In terms of length these dolphins get to around 2.5 meters, and weigh only 150kg! Like other marine mammals they like to live in large packs known as a school, and any single school can contain up to 100 dolphins, and they sometimes travel with other species of dolphin and even large whales. Just like Orca’s they like to dine on squid, but they also have a taste for small fish such as anchovies and sardines. They also like to feed at night, and play by day. So there you have it, four very different sea creatures that are some of our favourites in the BC area. Each so different from the last, but all fascinating and magnificent in their own very special way. Make sure when on board one of our yacht charters you take in the environment around you, and keep your eyes peeled for some of the world’s best marine life. It will be an experience you will never forget.